It is 4 Channel Isolated 5V 10A Relay Module, A wide range of microcontrollers such as Arduino, AVR, PIC, ARM and so on can control it. Relay output maximum contact is AC250V 10A and DC5V 10A. One can connect a microcontroller with standard interface directly to it. Red working status indicator lights are conducive to the safe use. It has a wide range of applications such as all MCU control, industrial sector, PLC control, smart home control. Ready to get switching on your Raspberry Pi?! 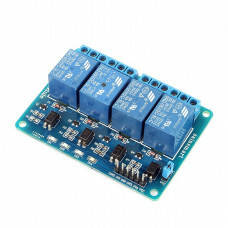 This neat relay module features 4 x 5V relays rated at 10A/250V each. It is designed to switch up to 4 high current (10A) or high voltage (250V) loads with the help of microcontroller!